I started shooting and editing video in high school. I used “Super VHS” cameras and tape-to-tape editing decks at the local public access television station. It was nearly impossible as a student to edit video on a computer in the mid 1990’s. Obviously, a lot has changed since then. Nearly everyone has the tools to shoot and edit video on a device smaller than a slice of bread. We no longer need a public access television station to have our own “Wayne’s World” experience through Facebook Live or YouTube. A growth mindset has been critical to my success as a small business owner. The tools and techniques I used four years ago to create videos have changed dramatically. I’ve never been someone to sit still and get comfortable for too long. In September 2016, I made a strategic decision to better meet the needs of our clients. I noticed many organizations we were working with needed more than just a video. They needed strategy and a plan to use video as one of the tactics to achieve their goals. My team started working behind-the-scenes to develop what this would look like and how we would make a pivot with the current business. Things became official on February 21, 2017. We announced a new name and a new vision for the future. 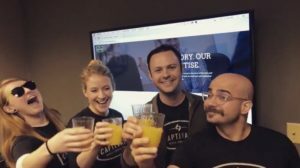 With mimosas in-hand, Captivate Media + Consulting launched to take us beyond the work we could do as Capture Video. So what’s changed over the past year? We’ve grown in a lot of ways. Our team of four has become a team of seven. We outgrew our office space in Eden Prairie and moved to Golden Valley in June 2017. Our services have expanded and we’ve been able to help clients with communications strategy, logos, branding, photography and design. Personalized video has allowed our clients to be innovative in their delivery of email messages. The results of our work have been impressive. We’ve been able to be more strategic and hands-on with strategy development and content creation for our clients. In 2017 we worked on 15 school referendum campaigns with a 100% success rate. Our newest offering, Voices of Tomorrow, will help school communities engage in conversations dealing with diversity, inclusion and student achievement. It’s an innovative approach using proven communication methods. I believe change is good. Working with technology, change will always be part of our company DNA. While it’s fun to reminisce about the old days with VHS tapes, it’s the future that excites me. Our work truly makes a difference for schools and communities across the country. With one year under our belt as a media and consulting company, I know our best work is yet to come.